I love to tell stories and I never let the truth get in the way of a good one. But if you want the truth, just ask a veteran for a story. My friend Ken Leach of Gainesville, Texas, has a doozy about a German prisoner of war (POW), the 1964 Tokyo Olympics and Lake Texoma. Ken was in the Navy in 1964 and happened to be stationed in Japan at the time of the Olympic Games. He was enjoying his view from the stands when someone tapped him on the shoulder. When he turned around he saw a middle-aged man grinning at him. “So you are from America?” the man asked in a German accent. Many small towns around the United States had military installations during World War II. The town where I’m living now, Brooksville, FL, had an Army air field where B-17 bomber pilots were trained. Gainesville’s Camp Howze had training facilities and a POW camp. When I was a child my mother would drive me out to the site of Camp Howze. By then there was nothing left except concrete block foundations and an occasional set of steps leading to nowhere. My father operated an ice cream truck at Camp Howze. As a boy on the farm my dad caught a splinter in the eye because he was too close to his brother who was chopping wood. Dad didn’t pass the physical for the Army because he was blind in one eye. Not being able to serve his country in time of war bothered Dad the rest of his life, so he always bought a red plastic poppy on Memorial Day. Now you may think that wasn’t much but my father was tight with his money. One year he asked me what was the least amount of money he could give me to make me happy for Christmas. So for Dad to go out of his way and voluntarily donate to veterans was a big deal. Every camp had work details to keep the prisoners busy during their stay here in the United States. At Camp Howze, the POWs were trucked every morning to the construction site of Lake Texoma on the Red River. Truth be told it didn’t look as pretty as it did in the John Wayne movie of the 1940s, so I think a California river played the title role. The POWs cut underbrush and hauled out debris so that after the dam was completed and the lake filled up, anyone who fell off their water skis would not be poked by an errant tree branch. When Lake Texoma was officially open, it was the fifth largest man-made reservoir in the country for about two and a half minutes. Another reservoir was built somewhere out west and passed it by. The camp had a regular routine for their guests from Germany. First thing in the morning they were fed a large warm breakfast. Around noon, they were given a sack lunch and after the closing whistle in the afternoon, they were trucked back to camp where a large hot meal awaited them. This was a better schedule than they followed when they were taking orders from that crazy SOB Hitler. One afternoon, however, Ken’s affable acquaintance from the Tokyo Olympics did not hear the whistle which told them to run for the truck. After chopping away at the brush a little while longer, he began to wonder when they were going to blow that whistle. When he walked to the usual loading area, he realized no one was there. He was stuck there on the banks of the Red River without a way to get back to camp and his dinner. His only alternative was to hike down to the country road which would lead back to Camp Howze. Who knew when he would be fed because the camp was more than thirty miles away. His heart raced when he heard a truck engine behind him as he trudged down the narrow highway. Looking behind him, the POW saw an old pickup truck coming towards him driven by an old Texas farmer. Two things made the upcoming encounter a bit chancy—the German wore the striped uniform which easily identified him as a POW and this was a farmer in his pickup and he probably had a shotgun on a rack on the back of the cab. One more thing—the POW spoke very little English and you know darned well that a Texas farmer in the 1940s didn’t speak German. Like any good story, this has a moral to it, in addition to a lot more truth than I’m used to telling. We all know the United States joined together in military strength to defeat our foes in World War II. But when it came to how we treated the German prisoners of war, we joined together in heart and soul to make them friends. 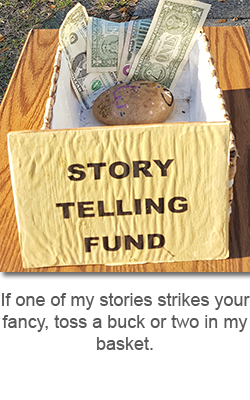 This entry was posted in Opinion and tagged opinion, storytelling on August 2, 2018 by jerrycowling.